Yeah we gave them time. like announcing something, get some big hype and give NOT A SINGLE INFORMATION after 6/7 months. 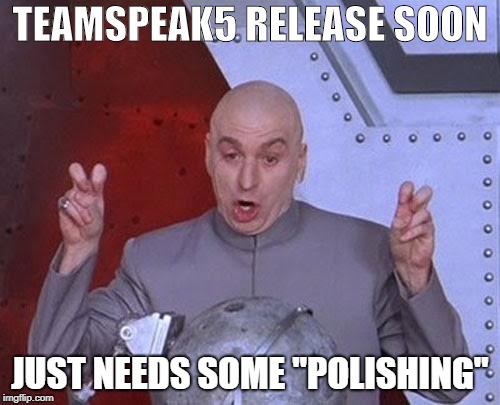 Why didn't they even finish teamspeak 5 before that big announcement? it is not possible that not even a screanshoot of TS5 has yet been released, for those who say that there is nothing to show, I think it's wrong because in Cologne they showed something, so why do not all of this show it to everyone? Yes it is very hard, welcome to teamspeak. Dear Teamspeak a screenshot would be nice? you are loosing gamers by doing this i mean i was loyal to teamspeak but im shutting down my community i waited 22 days and nothing. my servers dont get paid with hopes and dreams. The easiest way is to promise and then not even release any information. The microsite should actually get released in Mid-January and it's already over that date. It won't effect anything if we add more complains in this thread - best thing is to shut up and wait for them, isn't it? Don't worry we read all the posts in here and in suggestion thread. The Microsite is under review and you get informed as soon it is online. Our Team is working hard on the client for a beta release. And yes a part of the Team is still working on the server. This work doesn't interrupt or will delay TeamSpeak 5. Sorry I can't give you any date or details. Last edited by dante696; January 24th, 2019 at 07:52 AM. Reason: wrong word meant to say "working hard"
Our Team is hardly working on the client for a beta release. When you read all the messages in this thread, why you dont give any informations about TS5 and no really statement about the delay? What I don't get is you showed TS5 @ Gamescom... but a demo can't be shown here? I have a theory, even if you do release TS5 I don't think it will matter because you barely listen to users suggestions and reject most of them, besides this whole TS5 campaign was a total disaster. So even it does release, I feel you won't be giving users suggestions a moments notice, unlike discord where they have a portion of their site dedicated to users voting for their favorite feature.